Manage your DOTA Mods easily. 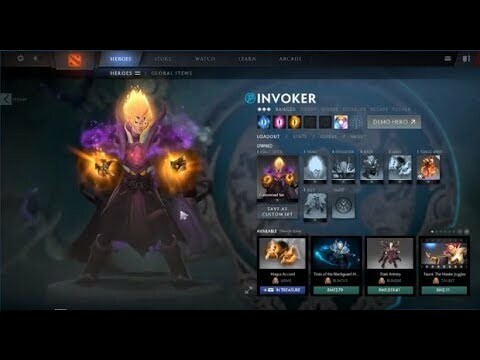 There are hundreds of hero items and sets and you just can't afford buying all of them but would be really awesome if you could just see them in action. Nope. Valve allows mods because only you can see them and other players can't, so it doesn't affect the game's economy. Consider this as a demo of the items that you are interested to buy later on. You can choose what mods you want to see in the game. If you have installed multiple mods for the same hero, you can choose which one to be used by setting it as default. You can install multiple sets for a hero and add them to Shuffle. This means that when you click "Save Mods" or "Save & Play" the app will choose one mod randomly from your list of installed mods. Note: To get another random mod you have to exit Dota and click "Save Mods" or "Save & Play" again. This will make the app completely ignore the installed mod. This will make the app completely ignore the installed mod and you won't see it anymore either. Why dismiss a mod? Maybe you don't like it for whatever reason and you don't want to see it anymore. But if you want to "Restore" a mod you can click "Dismissed Mods" and view all your dismissed mods. If you check this option then the next time you will open the app it will Get Minimized, Save Mods (also shuffling them) and Launch Dota. This is very helpful if you have already chosen which mods you want to see and you just want to play. Note: On major updates Dota will overwrite your mods so you have to Save them again and relaunch the game. You can search for mods or filter them by Rarity or Hero. So what mods (or skins) can you use? Well, you can use every item that has been made. For example: Hero Sets, Immortal items, Arcanas. But also Terrains, Weather, Music, Announcers, Item Effects, Roshan skins, absolutely everything. But the list doesn't end here, on top of these you also have Custom Mods made by the fans of modding. These custom mods can be either simple recolorings of other items, completely new items that didn't get accepted by Valve, or models from other games. There are over 3200 Mods and over 7500 Mods Parts choose from. And we're constantly expanding the list. What OS does the program run on? Currently Dota2Mods app can run only on Windows (x32 and x64) but we're planning on bringing it to Mac too. Read our News and Blog sections for the latest updates.